In Furniture > Show & Tell. 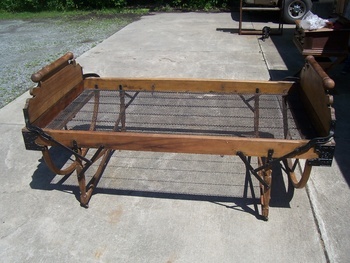 Need some help- has anyone ever seen a bed like this before? When you push the headboard and footboard in the legs fold up and the bed sits on the round rockers! I don`t know why, because it would tip over, besides, the headboard and footboard would be in bed with you! It measures 6' x39" inside the rails. Can`t find anything about the maker. Help? Thanks aghcollect! Any ideas on it`s use? 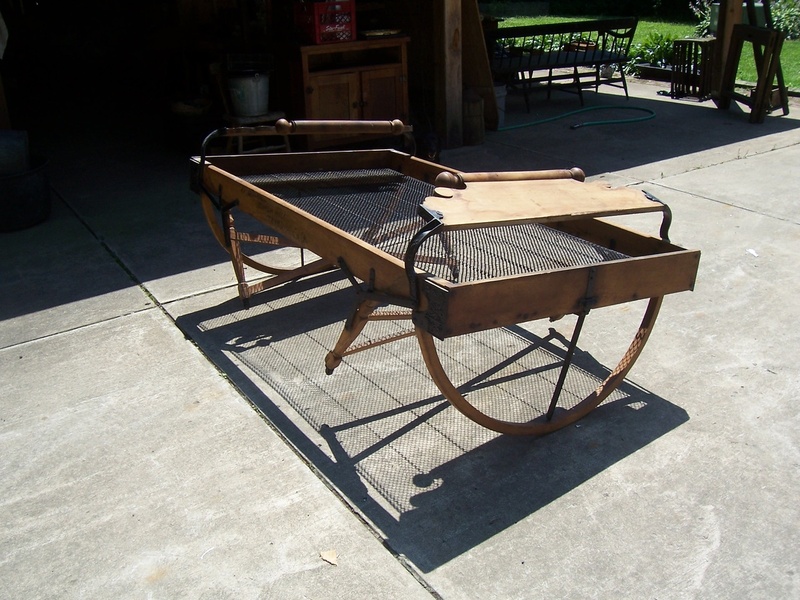 Well, looking up his history - he was a late 19th century folding cot bed manufacturer - I found some similar patents for the folding legs and spring beds but no rockers. I am wondering if was used to rock a baby, of course there would have been a mattress on top of the springs. H.W. Ladd, folding bed, patent # 441,569, NOV. 25, 1890. you take it from there. Thanks fhrjr2! 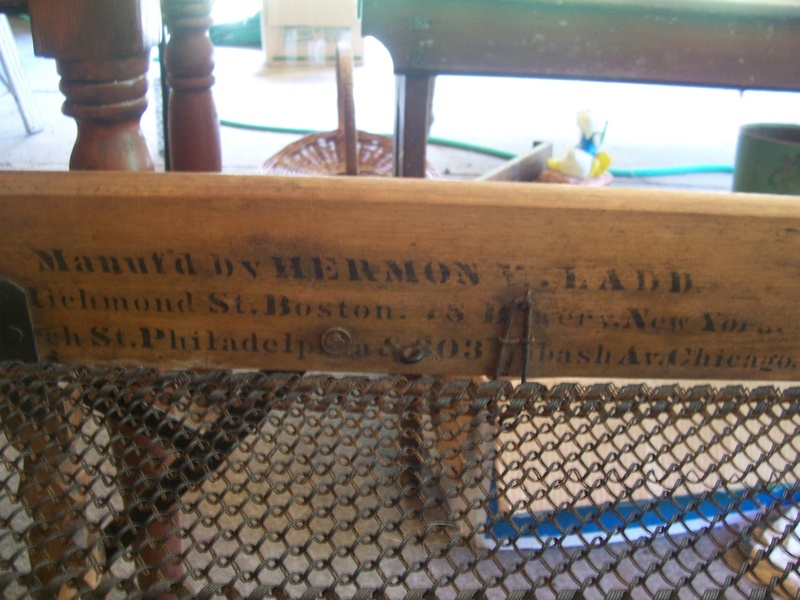 I looked up Hermon W. Ladd and got nothing, guess I should have just used his initials! Thanks again! 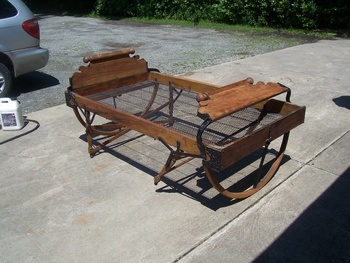 Maybe a toddlers bed to take along when visiting Aunt Iva. Seems really risky for a baby. Thanks PCC! I understand the fold up legs but I can`t figure out what the rounded pieces are for!?! Maybe the 'rockers' are just to facilitate the easy flip-movement up against a wall and out of the way when not in use? The headboard/baseboard folding over the mattress would certainly be a practical function to hold all the bedding together when flipped on its side. The only drawback would be the curved pieces sticking out and getting in the way, thus not really gaining much space with the bed on its side. Are they easily removable, or perhaps have their own folding mechanism? Kydur, the curved pieces also fold in. I like your idea for the function, that makes the most sense. Thanks! Also Thanks for all of the love its! No problem. The fold-away functionality of this antique makes it more practical as a hide-a-bed than the modern ones; and nicer looking. Sometimes the old stuff just can't be improved upon!